It’s taken me a while to write this post because I’ve found Edinburgh Yarn Festival a real challenge to describe. It stands apart in my mind from all other yarn shows and I wanted to explain exactly why that is. For a start, it’s a big show. Much bigger than you would imagine from the size of the building that contains it. This year, I think for the first time, there was a marquee at the back of the venue which had space for 500 knitters and crocheters to sit and chat, drink tea, eat cake and knit, and crochet, and there wasn’t a single time when I ventured in there, where it wasn’t filled to that rafters with happy gossiping voices all cooing over each other’s yarn purchases and projects. It was a truly wonderful thing to behold. It was also nice to be able to get a seat whenever you needed one rather than having to squeeze your bum on the end of a sofa where there really isn’t a bum sized space. This also has the added bonus of making the market place much less of a crush. There wasn’t a point where I couldn’t squeeze through the throngs or couldn’t get the see a stand. I had time to browse, time to read labels and time to squish, which made the whole experience rather relaxing. There was also another smaller area for refreshment (my friends dubbed it the purple room) which contained the lovely podcast lounge where I wanted to linger but there was never a spot free – and I was, ridiculously, too shy to speak to Louise Scolley from Knit British, who hosts it – but no matter, there is always next year. Blacker Yarns and Garthenor were also here and I gathered lots of ideas for future online purchases. So, to the market place. For me, this was a delight as there are so many vendors from the Scottish Highlands and Islands who so rarely get to shows further south. It was fabulous to be able to talk to so many passionate producers of yarn, who could tell you which farms their fleece comes from, describe the sorting process of the fleece and talk with love about their mill equipment and their product. It gave me a real buzz to know that my yarn purchases were supporting the employment of so many, often in quite rural locations where jobs are scarce..
Obviously, at this point, I was sticking to my 2018 resolution to only buy yarn that is grown spun and dyed in the UK, so my first purchase was from the Knockando Woolmill, who are based nearish to Inverness but not actually near to anywhere really. Their history stretches back to 1784 and they are still using some equipment dating from 1870. The mill is run by a charitable trust which was established in 2000 with the aim of “rescuing and restoring the mill to ensure its future survival and promoting and educating people about its unique heritage”. The restoration of the mill was completed in 2013 and they produce the most gorgeous textiles, but it was their yarn that interested me most. I was particularly drawn to an undyed North Country Cheviot double knit yarn which was grown on Dalrachie Farm, located just 12 miles from the mill. This news, together with their story, pressed all my sustainability and supporting British farming and industry buttons, so I bought a sweater quantity. And I’m now on the search for the perfect project to do justice to the yarn, and to the mill. Then on to The Knitting Goddess and her One Farm Yarn was on my list. I’d previously purchased a set of grey and black mini skeins together with an undyed skein and then decided, for the shawl project I had in mind, I need a further set of mini skeins, and another undyed skein just to be on the safe side. The ply on this yarn is really pretty and The Knitting Goddess’s colours are gorgeous, plus the fact the yarn is NOT well travelled speaks to my eco soul. Next stop was Uist Wool. I have been stalking them on social media for a while. The idea for the mill, built in North Uist in 2013, “emerged from a collective will to find a fresh purpose for local fleece that would reconnect the community with their cultural heritage of wool-working”. They have restored machinery that has its origins in mainland mills from the middle of the 19th century and the wool they produce is very individual. I wanted some buttons for my striped cardigan and they stock porcelain buttons from Shoreline Stoneware. The buttons take their inspiration from the shoreline of Uist and are just a joy. I also had to have yarn from Uist Wool but I was aware that my carry on bag was filling up so I decided to restrict myself to just one skein. This makes the skein I chose even more precious. I also visited Jamiesons Of Shetland and bought these gorgeous 25g balls of their Spindrift yarn, without a project in mind but I’m thinking a fairisle cowl. Then we stopped at The Crochet Project and coo-ed over all the shawls and I bought the lastest shawl pattern book on a complete whim. At this point we stopped for a cup of tea and a piece of cake and I observed my now bulging bags and announced to my friends that I might not be able to buy any more yarn, otherwise I might not be able to get it home. 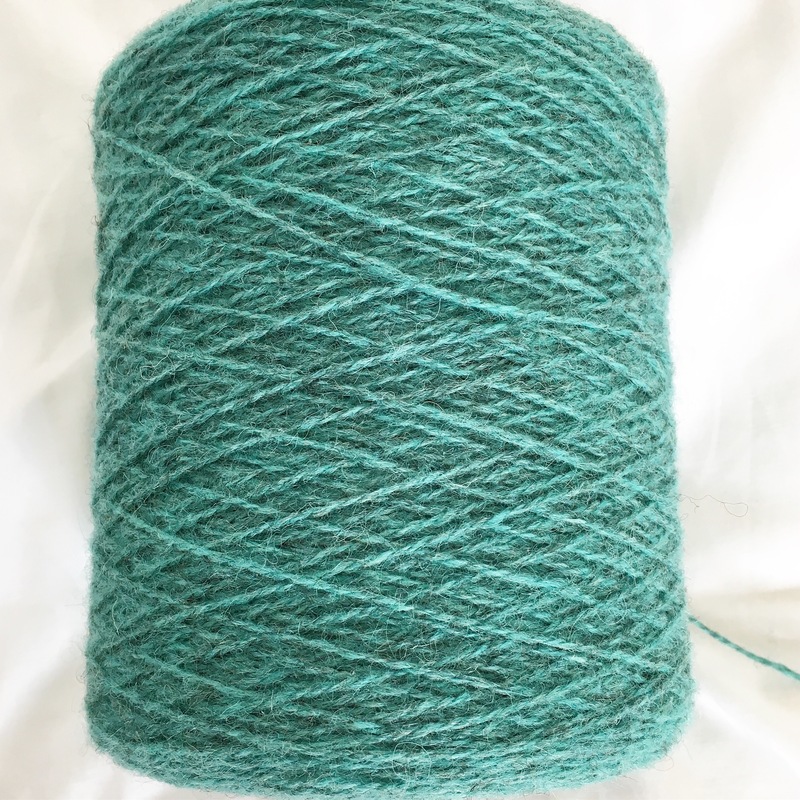 So, I think there might have been something in that tea, because I went to the Iona Craft Shop stand next and bought a cone of their gorgeous single origin double knit wool in the sea greeen colourway. Yes, that’s right, a cone. Not a skein but a huge, incompressible, how am I ever going to get this in my carry on bag?, cone. Still it gave my friends a huge laugh when I sheepishly unveiled it and just look at those colours, and I did eventually manage to arrange the bag to squeeze it in, so it all worked out well in the end. I think I’m going to knit a Tin Can Knits Windswept sweater with it. Well, after that, the gloves were well and truly off. I decided to buy presents for a couple of friends who weren’t able to come to the festival so purchased a gorgeous alpaca and rose fibre blend from The Border Mill. It will be interesting to see if the rose fibre helps to mitigate alpaca’s desire to stretch. I also bought another friend a present but haven’t given that to her yet so I’m not going to talk about that one, to maintain the surprise. Then we went to visit Ginger Twist Studios and I must admit with all the gorgeous colours and squishiness and with Ginger being so lovely and friendly, I completely forgot about my resolution to buy British and, in what I can only describe as a buying frenzy, grabbed these three gorgeous superwash merino beauties. What can I say? It was late, I was overcome with yarn fumes. I am weak. But do I regret it? Not on your life! And then after having our photo taken with the 8 foot high Toft crochet highland cow, I bought the yarn to make myself one. I have no idea about the yarn’s provenance. I just wanted it. This has been carefully stored away in my cupboard along with all the other kits I’ve bought from Toft and not yet made. I really really must get around it one of these days. Sadly, it wasn’t all fabulous. I’d taken some finished projects to show some vendors what I’d made with their yarn and one or two did not utter the words “ooh, it’s so lovely” or anything similar which was a bit deflating. One of my friends thought one vendor was downright rude about one of my makes, but you can’t please all the folks and maybe the vendor was a bit jaded by it being the last day. I’m not into naming and shaming, but I doubt I’ll be buying their yarn again. But, it was almost perfect. It was brilliant to hear so many soft friendly Scottish voices and if you have never heard a Shetland dialect before, it is a thing of wonder! 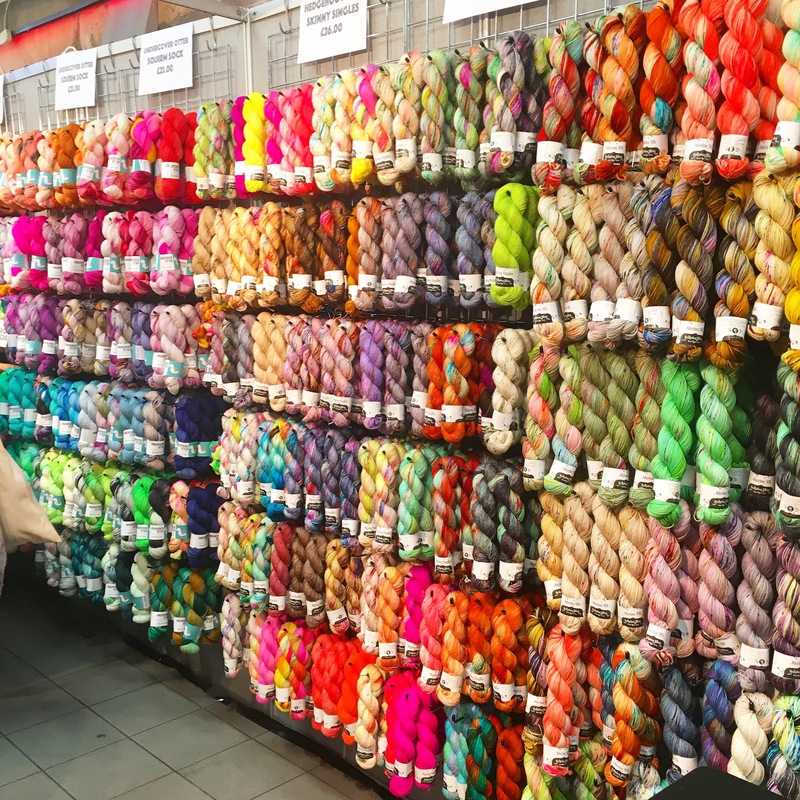 There was so much gorgeous yarn for sale, I could easily have spent 3 times as much so I think I’ll be returning next year, with a bigger budget and a case that is going in the hold. And lastly for Stephen and Penelope click here. I thought I’d share a few pictures of my Edinburgh Yarn Festival experience. I had the most amazing time, bought way more yarn than I should have done and then thought I’d lost it all when it didn’t come off the carousel at Heathrow (it did turn up eventually after someone was sent to hunt in the bowels of the plane 😅). I’ll write about the things I bought in a day or too, but in the meantime, feast your eyes…. Soooo was your February all hearts and flowers? As ever, mine was filled with yarn. 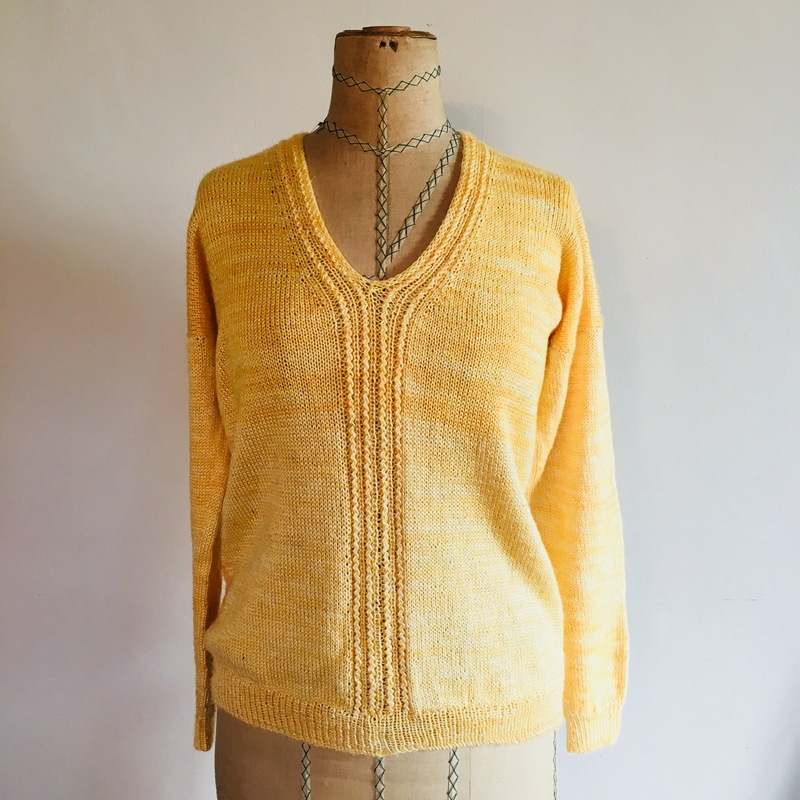 I finished my Alocasia sweater and it is a delight, although rather to fine to be worn everyday. It’s a merino/silk mix so I can’t really see myself doing the housework or walking the dog in it (my two daily activities aside from knitting), so I haven’t worn it yet. I don’t really hold with saving clothes for best but, in this case, given the amount of work put into it, I’m willing to make an exception. This was also the first large garment I’ve made for myself from yarn that I dyed. So, I’m really not kidding when I say I’m saving it for best! I also managed to finish my Dad’s team socks with self striping sock yarn from Devon Sun Yarns. They were a challenge as my Dad had polio when we was a child (in the days before vaccinations) and the disease as left him with rather odd shaped feet. So, consequently they aren’t my prettiest make ever but they were made with much love and my dad is delighted with them. Last up was a hat made from Ryeland wool. Those of you who follow me on Instagram might know that I’m taking part in the Knit British Wool Exploration during 2018. Each month is a different breed yarn. March is Ryeland so I was getting a bit ahead of myself and I meant to cast on a swatch but by the time I’d cast on, I was making a hat. The yarn was so deliciously springy I knew it would be great for a hat. And being aran weight, it knitted up really quickly. The hat pattern is one that I wrote called Curlew. The hat, after being dipped in some blue dye, has been gifted to my brother and he was so pleased with it, he wore it home. Of course, this means I still need to knit a swatch and get trialing it’s wearability next to the skin (although I’ve a pretty good idea already as I’ve already worn the hat a bit). I also have a confession to make. I got a serious attack of castonitis and actually had these three things plus another pair of socks on the needles at the same time. This was an interesting test to my usual monogamy and it’s not one I will be repeating for a while. I felt a disproportionate amount of anxiety about having extra wips hanging about. I also felt like it took ages to get things finished as I was splitting my knitting time between the various projects. So what do I have on my needles currently? The forth project mentioned above are some Tin Can Knits Lumberjack Socks I’m making in a gorgeous British Falkland Islands Merino/Silk double knit but I’ve hit a snag in that I’ve lost all but three of the needles and this isn’t enough to knit in the round. I’ve also cast on and knit a good part of a Siri cardigan. I’d like to finish this before I go to the Edinburgh Yarn Festival (squeeeee – I’m soooo excited) which is now in less than two weeks, so I need to get a wiggle on.